Phase 10 Card Game Rules, Review, Tips and Printables! The Ultimate Phase 10 Card Game Resource! If youve never played the famous Phase 10 card game before, youve missed playing one of the most exciting and fun card games of the century! Hey, with over 32 million units sold (2nd only to UNO), the Phase 10 card game is an absolute classic! With a pinch of strategy, and a heap of chance, the simple rules and unique gameplay gives you an exciting game from start to finish. Each hand is unpredictable, and challenging to strategize, but youll love to play it over and over again! If you have 45-60 minutes, youll have plenty of time to enjoy the Phase 10 card game. Short on time? Use the 10-Hand Game variation to create a fast and exciting game that moves from Phase one to Phase ten quickly... perfect for using at a party to quickly rotate people through. its fun every time and in every way you play it! Game Name: Phase 10: A Rummy Type Card Game with a Challenging and Exciting Twist! 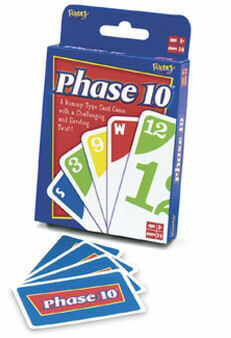 The object of Phase 10 card game is to be the first player to finish all 10 Phases before any other player. For each hand played, a player attempts to lay down their current Phase and then playing their remaining cards on lain-down "Phases". The first player that goes out (who has played all their cards, finishing with a discard), ends the hand and earns no penalty points. Every other player tallies their penalty points and records them. If there is a tie at the end of the game, the points (lowest score) are used to determine the final winner. Click here for official, detailed Phase 10 card game rules, gameplay instructions and how to use special cards. SETUP: Gameplay is clockwise. Each player is dealt 10 cards, with the remaining deck face down as a draw pile, and one card turned over to start the discard pile. Play begins with the player to the left of the dealer. PLAY: On your turn, pick up from either the draw pile or discard pile to begin your play. During each hand, each player attempts to complete and lay down their current Phase. To end your turn, discard any of your cards on the top of the discard pile. On the first hand, your goal is to lay down the first Phase. If you succeed at laying down the current Phase, you end the hand by discarding the rest of your cards on any laid-down Phase during the remaining turns of the hand. You cannot add cards from your hand onto laid-down Phases until you lay your Phase down first. On the following hands, if a player completed the previous Phase, they move on to the next Phase to complete. Otherwise, they stay on their current Phase until they complete it. This means that not all the players will be on the same Phase during each hand. END OF HAND: When the first player goes out during the hand, play finishes and the remaining players tally their penalty scores for the remaining cards in their hands. END OF GAME: The first player to complete the last Phase (Phase #10) and discards all their remaining cards ends the game. If more than one player manages to lay down the last Phase during the last hand, the lowest total score wins the game. WILD CARDS: Wild cards can be used in any run or set, as long as it isnt a run or set of wild cards by themselves. SKIP CARDS: Skip cards are used to skip any player of choice during a round of play. A round of play is once around the table. A discarded Skip card cannot be picked up from the discard pile. or not playing. If you pay special attention to the person on each side of you, youll have a decent chance of discovering what they need by which cards they discard and which cards they pick up. Knowing this can help you decide what cards to keep and which to give away. The best used Skip card is a wisely used Skip card. Dont waste it as a revenge card against someone who just played it on you. Save it for when you need it. Use it on someone whos about to go out if you need more time. Doing that will also, strangely enough, get it out of your hand in case they do go out since its worth a lot of penalty points! If the cards you are dealt dont make it obvious what to collect to complete your Phase, the general rule out there is to collect high cards for sets and low cards for runs. Since high cards are generally thrown out first, its a good idea to try to collect these for short sets (no more than a set of 3, though). Collecting low cards for runs helps keep your penalty points down if you dont manage to complete your Phase during that hand. This is best used if you are collecting for long runs of 7 or more. If you are looking for a shorter round of play, this Phase 10 variation plays only ten hands. The game starts on Phase #1, and each player automatically graduates to the next Phase on the next hand: whether they completed the current Phase or not. The winner is decided by total penalty points. Lowest wins. It's the same game as the standard Phase 10 card game, except that the 10th Phase only marks the half-way point! After the 10th Phase there are 10 more to play... 11. 4 sets of 2 12. 1 set of 4 + 1 run of 5 13. 1 set of 5 + 1 run of 5 14. 1 run of 4 + 4 cards of one color 15. 1 run of 5 + 4 cards of one color 16. 1 run of 10 17. 1 set of 4 + 1 set of 5 18. 9 cards of one color 19. 1 set of 6 + 1 set of 2 20. 1 set of 6 + 1 set of 3Warning! This game can take upwards of 4-5 hours... only for die-hard Phase 10'ers! While not a true variation on gameplay, it offers a different way of going out. "A variation of going out is for a player to draw a card and then play all cards in their hand without discarding. This is known as going out 'floating'. Because the player must be able to discard a card in order to actually end the hand, other players now have at least one extra turn in which to go out themselves or at least improve their score. In addition, a 'floating' player must draw a card and play it if able, and must draw the top card from the discard pile if it can be played; thus the floating player can be forced to play on their next turn instead of drawing and discarding. The floating player can also be skipped as normal. If someone else goes out before the 'floater', the floater receives a zero score, but does not technically win the hand. The strategic value of floating is that the person immediately preceding the floating player is generally forced to try to 'keep them afloat' for at least a few turns, either by discarding cards the floating player is required to pick up and play, or by skipping the floater. This generally puts the player preceding the floater at a disadvantage compared to the other players and makes it less likely that that player will be able to finish their Phase if they have not yet done so. Players can use this strategy to 'gang up' on one player; the player after them will float, forcing the player to try to keep them afloat while all other players get a number of extra turns to try to lay down their Phase or go out. Of course, the player preceding the floater is not actually forced to keep them afloat and may be able to go out themselves, lay down their Phase (thus drastically reducing their score for the hand), or may simply concede the hand by allowing the floater to draw (the card drawn is likely to be an unplayable, thus discard-able, card). If a player is floating, and there is no possible card that could be discarded or drawn to prevent that player from being able to discard, they are known as 'floating dead'. This is rare, and usually happens when the floating player completes Phases 5, 6, or 7, no-one else has completed their Phase, and the floater's run has expanded through all 12 values. If no-one else can lay down a hittable Phase in that turn, only another player playing a Skip or the floater drawing a Skip will keep the hand going, and only 4 exist in the deck." Click the links to read and print the PDF in your browser, or right-click it to download it to your computer. Printable Phase 10 Phases and Rules. Cheat cards of all the 10 Phases and each cards penalty points as well as a set of the Phase 10 card game quick rules. Phase 10 scorecards with scoring/points summary. Wow! If you've made it all the way down to the bottom of this page, it shows that you are keenly interested in playing this ever-popular Phase 10 card game. Whenever I discover any new Phase 10 rules, Phase 10 variations, Phase 10 strategies, Phase 10 hints... or really anything else to do with the Phase 10 card game, it'll show up here. Count on it! So come back often, and let's play... Phase 10!